CHARLOTTE, N.C. (WTVD) -- A Charlotte man is celebrating after his craving for coconut juice led him to win a $100,000 lottery prize. Jorge Dominguez Santos' odd, good fortune happened Sunday when he stopped by the Circle K on Central Avenue in Charlotte to get some coconut and orange juice. 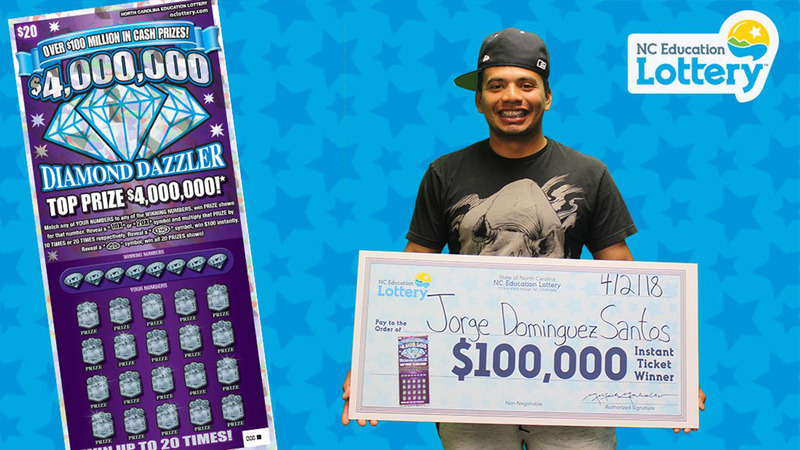 When he went to pay, he decided to buy $4,000,000 Diamond Dazzler scratch-off ticket. "I just figured, 'Why not?'" Dominguez Santos said. As he scratched the ticket, he told lottery officials that he couldn't believe his eyes. "The prize was the last number I scratched," Dominguez Santos said. "I saw the '36' and '36' and knew I won something. I kept scratching slowly and saw the number '1'. I thought, 'Okay. Maybe I won $100.' I kept scratching, and I couldn't believe it. I started screaming I was so excited!" Dominguez Santos claimed his prize Monday morning at lottery headquarters in Raleigh. After required state and federal tax withholdings, he took home $70,507; he plans to use the money to get a new home.